The mile-long lineup into Arrow Hall was a mish mash of retired ravers busting out their 90's Snug gear one last time to hipsters sporting the latest graphic Tees a la Justice. Everyone was in a calm demeanor but soon turned into a crowd of hyped smiling bobbing heads as we were feeling the bass pumping through the walls. There was good reason for the hype as Daft Punk was last here on the same grounds back in 1999 headlining a Syrous labour day all-nighter. I was so excited to hear NYC's The Rapture was opening as their tunes were made to dance. They played a fairly energetic set, but clearly people were waiting to bring on Da Funk. I could be wrong, but Sebastian & Kavinsky were a no show, but they did blast Testarossa Autodrive and other favorites between acts. Rage's Killing in the Name remix was perfect to get an already dancing crowd to go nuts! 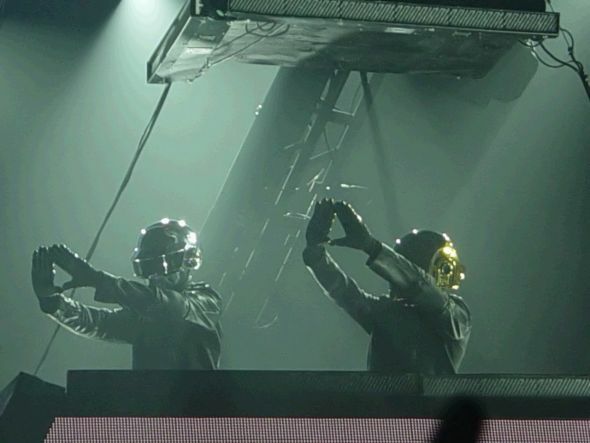 The lights went dim, the curtains swung open and the concert kids started screaming as the robot mask clad duo came up into their pyramid shaped souped up DJ booth. The back lights beamed out as thousands of colour changing LED's and lit up triangular grid structure surrounding the pyramid booth started flashing. This was only the beginning of Daft Punk's extravagant light show. This was luminaTO times a million, an over stimulation for the eyes and ears. With Technologic, the back LED's turned into a giant electronic billboard flashing tech words just like the video, but much, much bigger! With Around the World and Harder, Better, Faster, Stronger, colours from the entire spectrum of light and every single LED array were spinning in crazy patterns. 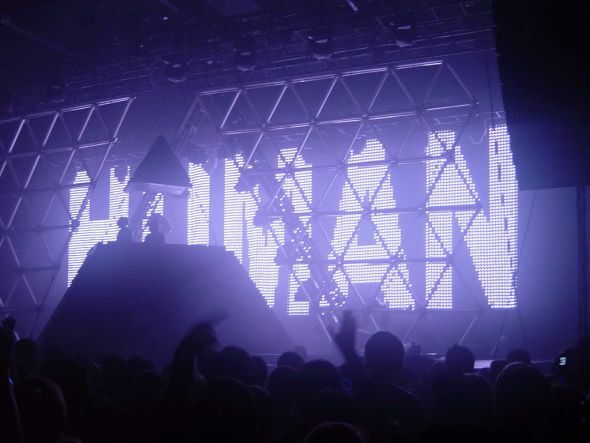 Just when I thought I saw it all, the entire pyramid lights up, covered in a giant triangle shaped LCD screen and it too is showing off what it can do, showing its full brilliance with Alive as its soundtrack. I won't tell you what happens in the encore part of the show, but suffice to say, it was a surprise ending. If you're really curious just check out this Youtube video in the last 30 seconds. You won't regret it. As I was riding back home on the Gardiner, I saw the CN Tower lit up with its new red LED lights and it brought a little smile to my face. Now that was a show!